Sir Ken Adam, best known for his work on several James Bond films, turns 95 today. His 95 years have been packed – he only stopped working 12 years ago. Born Klaus Adam in Berlin in 1921, he moved to the UK with his family in 1934 after their shop was forced into bankruptcy by Nazi harassment. He was excellent at art and went on to study architecture, avoiding internment as a German citizen when the Second World War started because he was being employed designing bomb shelters. Later he became one of only three German pilots to fly with the RAF during the war. After the war he went to work as a draughtsman in film art departments, then becoming Art Director and later Production Designer. Although his fame within the cinema world was primarily for designing the huge lairs inhabited by the villains at the end of the Bond movies, his design work went through the whole films, not just on those massive bunker sets at the end of the stories. Every element designed with expert care. His incredible stylistic work for the War Room in Stanley Kubrick’s Dr Strangelove or: How I Learned to Stop Worrying and Love the Bomb (pictured above) has arguably influenced the world more than any other scenic design in film history. Indeed in 1981, while on a tour of the White House, the newly elected President Ronald Reagan was desperately disappointed to discover the War Room didn’t actually exist. 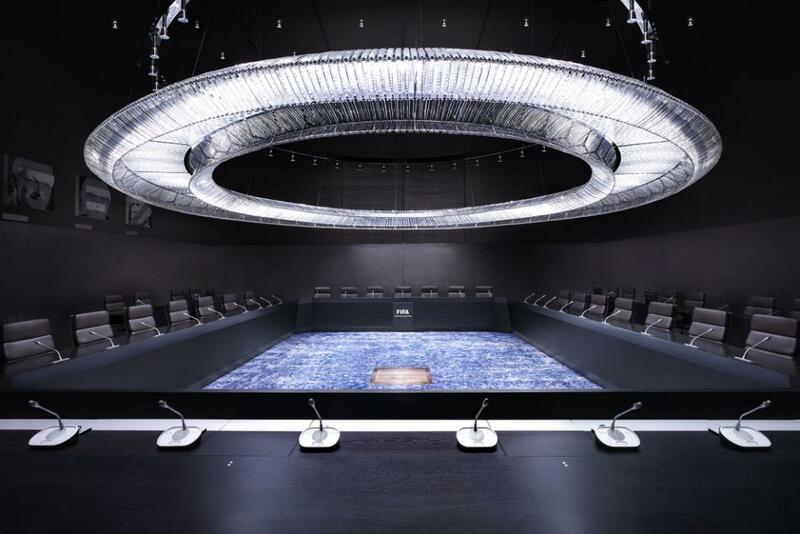 And it only takes one quick glance at the board room of FIFA to show that Ken Adam’s fiction has become an actual reality. Steven Spielberg told Adam “I’ve never met you before but I’ve always wanted to tell you that the boardroom in Dr Strangelove is the best set you ever designed and I think the best set that has ever been designed for a film”. There will be no arguments from us on that score, but of course it wasn’t all that he worked on. His career encompassed a huge body of work, from designing the car and film Chitty Chitty Bang Bang to the Gothic splendour of Addams Family Values, through to the Oscar winning designs of Barry Lyndon and The Madness of King George. 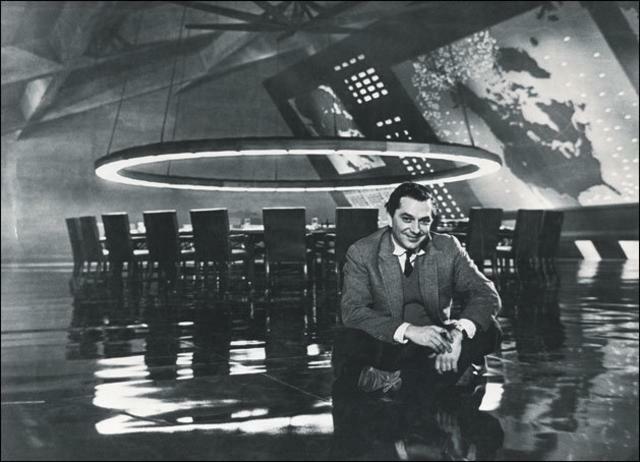 But it is the Bond movies and Dr Strangelove for which he is best known, so much so that in 1999 the Victoria & Albert Museum featured him in an exhibition called simply Ken Adam – Designing the Cold War. He basically created the entire cinematic look of the Cold War which still influences filmmakers today, from scratch using nothing but his own imagination. The Bond films he was involved in were Dr. No, Goldfinger, Thunderball, You Only Live Twice, Diamonds Are Forever, The Spy Who Loved Me and Moonraker; he basically set the style still used throughout the spy genre today. Sir Ken Adams last film work was for the movie Taking Sides in 2001 although he did reprise his Bond work for the video game Goldeneye: Rogue Agent in 2004. He was knighted in 2003. Happy 95th birthday Sir Ken!